A full on, bullet-train paced delivery, a blur of props and no sooner had one penny dropped, but another quid’s worth of loose change was metaphorically flung at the audience. Delivery was as professional as I’d seen all night, you could see that Roger has done over 100 gigs to get this down to a fine art. 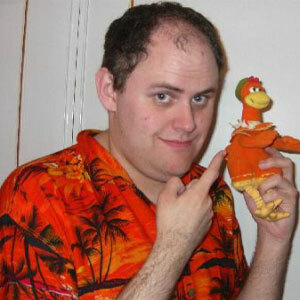 We caught up with Roger at one of his many Telford gigs to find out what makes the Godfather of Telford Comedy, tick. Two elements came together. Firstly I used to be a regular music festival goer about 8-10 years ago but I’m retired from that now. I used to watch ‘’live @ the comedy store’’ on Paramount Comedy (now Comedy Central) on Sky with a friend (former fellow festival goer) and I repeatedly kept pointing out that no comedian ever seemed to do material about music festivals, so maybe there was a gap in the material market. One night he cracked and told me if I thought there was material in that subject I should try writing it. I then started writing material about festivals and other stuff as well. Next step was to start sharing it so I started finding all the nearest open mic comedy nights I could find to perform it. It very quickly and became addictive,but just as quickly my act began evolving into something completely different to everything I had originally thought it was going be, but that’s another story! Watching your act, you say there is no one quite like you, and I’d have to agree! Can you describe your act in a single sentence? Tim Vine meets Joe Pasquale meets Tommy Cooper (on speed). To us mere mortals, a five minute slot on a comedy night seems so short, but once you are up there it probably seems like forever. How much preparation goes into that five minutes? Time is perspective when you are up there and comedy, however you look at it, is a subjective art therefore audiences have different levels. If you get a crowd who are just not on your level then five minutes feels like an awkward hour-long silence. When the audience is on your level and you are ripping it, five minutes flash by in the blink of an eye. This is why most promoters play it safe with middle of the road comedians. Preparation varies from act to act because you never know what an audience will laugh at until you try it. I am personally a perfectionist and have spent hundreds of gigs working it down the strongest five minutes of gags in the right order (and I am still not completely happy). Some others have the gift of just ad-libbing five minutes with four things scrawled on a piece of paper and yet are able to get an audience roaring. You’ve appeared all over the UK, often at your own expense for just a few valuable minutes of stage time. How does that rainy night in Manchester feel? When you get up on stage and perform, the first 30-40 seconds is everything. If you can get the audience on your side, all those miles you’ve travelled will magically disappear and it feels like walking on sunshine and totally worth every penny you’ve spent getting there. If they’re just not your audience on the night, then it’s a long drive home but you’ve got take those two possible outcomes together and live for the former get over the latter. What was the comedy scene like in Telford when you were trying to get some gigs or stage time? It didn’t exist! We’ve obviously had big names and TV stars doing their shows at The Place in Oakengates (for up to £30 a ticket) for years but for non-professional comedians there was literally nothing at all for us. So after nearly 2 years of gigging around the country, I figured no-one else is ever going to do it. I thought it couldn’t be that hard, and now I knew how they worked and how they should be run I thought I’d just try running some myself. You are now a successful promoter as well as a performer, which do you enjoy better? I’ll make it clear that I love promoting. I’m now that obsessed with live comedy, I like being able to have acts come and perform on my doorstep for me. Nothing beats the magical feeling of being up there and seeing an audience react and laugh at the jokes I’ve written. If I ever did get the chance to “make” it. (that is have one of the big comedy agents trying to sign me) then won’t deny I’d stop being a promoter on the spot if that ever happened. Honestly, I feel it never will, so I’ll enjoy being both and will continue to both for the long haul. Being a comedy promoter gives you the chance to help out other novice comics, how does that make you feel? Fantastic. When you very first start out it is really hard to get gigs from people. So many promoters ignore you and you wonder how anyone got started, so one thing I said when I became a promoter is I’d always reply to every e-mail and book everyone who contacted me and asked for a gig. I still only re-book a choice selection of them for paid stuff afterwards, but I’ll always give anyone who asks an unpaid spot regardless of past experience. To date five people from Telford have come and performed their first ever gig at my open mic night, four have since ceased performing but one of them, Ben Doyle, has really stuck at it and I’m now stuck with him as a comedy partner. What’s next for Roger Swift? Roger Swift the comedian still has to work and get a solid 20 minute set so has many more gigs across the country, more miles, more stage time, more promoters to try and impress. I’m a Marmite comedian who divides audiences down the middle and thus divides other promoters down the middle. I’ve got more gongs to beat and more comedy competition finals to try and reach, until the night I am in the right place at the right time. Roger Swift the promoter will continue to run gigs in Telford (and other places near-by) providing stage time for his brothers and sisters in comedy, and laughs for the audiences who are interested. Where can the people of Telford catch your shows and see some raw talent? All acts are vetted via the first two before being booked to perform at the third.